The second series of the BBC's fantasy drama series, Atlantis has begun and it is one of my favourite things to watch on a Saturday night. Not only is the storyline this year a continuation from each episode, which makes the show oh-so gripping, each episode is action packed with drama and suspense. In regards to the fashions sported in mythical Atlantis, they are as elegant and beautiful as the individuals wearing them. In this particular post, I want to focus on the hair styles which are iconic to our female protagonist, Ariadne played by actress Aiysha Hart. Since my hair is naturally poker straight, I sometimes love putting plaits in and getting a bit of wiggle in my hair, for a different look. I have noticed in Atlantis, Ariadne always has curls or waves in her hair and the overall style tends to be symmetrical, likely because she wears a crown and in order for it to sit right her hair needs to be equal on both sides, but I digress. I feel the pictures speak a thousand words and you'll get the idea of what I've done by looking at them, but put simply, I put plaits in the night before, then took them out in the morning, before taking hair from nearest the front on either side of my face and twisting them, and affixing them at the back using bobby pins. This look is great, versatile and one you've mastered the art of the fish-tail plait, you will be able to do it in no time at all. If you don't know how to do one just yet, you can check out my tutorial here. I can guarantee, once you've mastered it, it'll be one of your staple styles. Obviously this is an intrinsically vital part to any outfit and finishing off any look. 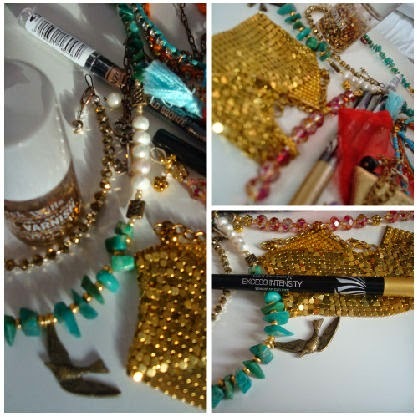 I always associate gold, turquoise and other precious stones with mythology. Gold represents wealth and also the warmth of the sunny climate which is typical of exotic cities, and precious stones have always been believed to hold magical properties, which makes perfect sense, afterall, we are talking about Atlantis! The gold eyeliner I have featured is by Max Factor and is from their 'Excess Intensity' range. It is long lasting and is gloriously rich and regal! My gold nail varnish is from Jack Wills and my jewellery, including my statement piece necklace is handmade by Pebble Beach Studio. I hope you too channel your inner mythological princess or queen and try out whichever look as taken your fancy! Let me know how you get on with it if you do. I love the front twist hairstyle. Really beautiful. Thanks for inspiration.